Last fall I published a post about the epidemic of heroin addiction that is currently scourging the USA. In it, I noted that the majority of those afflicted by opiate addiction started not with other illegal drugs but with prescription drugs based on the same opioid chemistry as heroin. The problem has ballooned in the last half-decade, but its origins are twenty years old. It was in 1996 that the drug most closely connected with the rise in opioid addiction, OxyContin, became available. The background to the story pinpoints some of the most critical issues of the American system of health care. OxyContin was developed from oxycodone, an opioid pain-killer invented in 1916 at the University of Frankfurt in Germany. Adhering to the tradition of each new generation of opioids, oxycodone was marketed as a more effective and less-addicting replacement for its predecessor (in this case, Heroin, product of the German company Bayer). Oxycodone reached the USA in 1939, but it was not a significant factor in drug abuse until 1996, when Purdue Pharma tweaked it into OxyContin. Purdue Pharma is a privately-held company that manufactures a number of heavy-duty painkillers susceptible to abuse, including fentanyl, codeine, and hydromorphone. Their 1972 development of Contin allowed a controlled release of such drugs over an extended period of hours. Twelve years later, Purdue began marketing MS Contin, an extended-release morphine. But a decade later, the patent protection for MS Contin was running out, and it would soon be available as a generic drug, thus depriving Purdue of most of the profit. Their big breakthrough into a high-sales, high-profit product came in 1996, when they introduced OxyContin. OxyContin was a result of the mixture of oxycodone into a Contin delivery base. Purdue’s initial press release stressed the product’s long-lasting effect, twelve hours instead of the usual three to six. 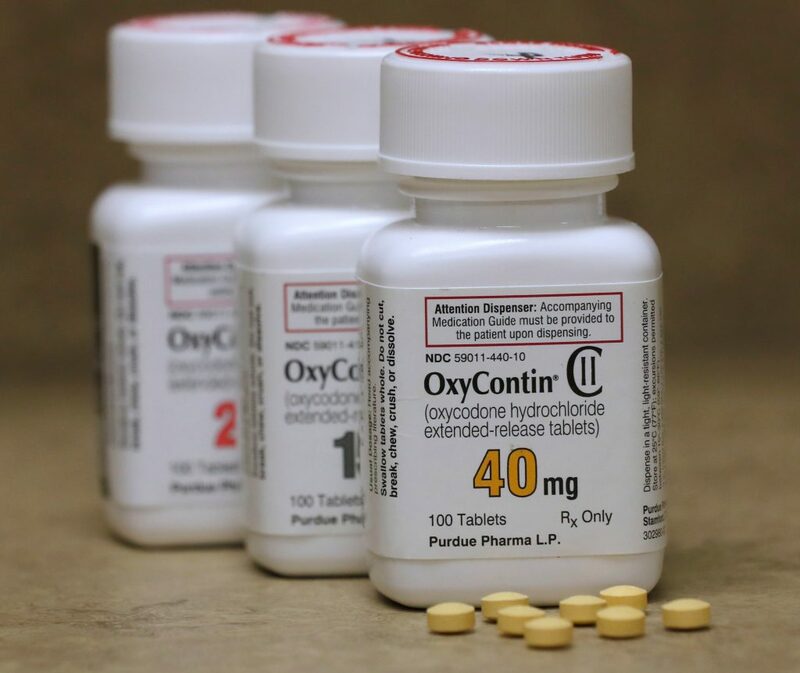 OxyContin was at its basis a timed-release version of the old generic drug oxycodone, but that adjustment made it a proprietary drug that Purdue could patent and for which it could obtain exclusive production rights. The patent/exclusivity issue is a complicated one, but it can be generally said that while a drug is under official protection, any profit from its manufacture and sale goes to the company that developed it. Since its introduction, OxyContin has brought over 31 billion dollars in revenue to Purdue Pharma. The problem for Purdue was that its claims were not being borne out in practice. A Los Angeles Times investigative report published early this month revealed that within a short time after its introduction, OxyContin was found to be effective in most patients for less than the claimed twelve hours. As a result, doctors began prescribing its administration at shorter intervals. This alarmed Purdue, because the whole justification for OxyContin’s being a “new” drug for which they alone had production rights was that it was effective for twelve hours in over half of patients. Purdue’s response was a campaign of sending out a large number of salespersons to induce doctors not to prescribe OxyContin at shorter intervals, but instead to prescribe it in larger doses. Increased dosage of opioids is known to be a compelling factor in opioid addiction, but the twelve-hour promise was the basis of Purdue’s highly profitable product. The aforementioned Los Angeles Times report is a fascinating look into the secret dealings within a “Big Pharma” company, focusing on the need to continuously develop high-profit drugs. The most profitable drugs are not necessarily those that are most useful, most effective, or most needed. For example, public health officials constantly warn of the diminishing effect of existing antibiotics on disease-causing bacteria, which are becoming resistant to the antibiotics we have now. New antibiotics are badly needed, but the financial incentive to produce them is not great. Antibiotics are short-term drugs; a few days of treatment is usually all that is needed. In addition, as bacteria become resistant, they will become obsolete. The real profits come in the development of drugs for chronic conditions in which the patient takes the drug every day for life. Thus treatments for diabetes, Crohn’s disease, arthritis, and similar conditions are high priorities for drug research-and-development programs. Control of chronic pain is one of these profit-producers. Internal memoranda show that Purdue was so concerned about losing market share in drugs for treating chronic pain that they pulled up the relatively ancient oxycodone and tweaked it with the aim of making it longer-lasting. Then, when they found its supposed vital difference (extended effect) was suspect, they pressured physicians to prescribe higher doses instead of more frequent administration. By 2001, National Public Radio was reporting that OxyContin was the most widely-abused prescription drug in the country. It was at the forefront of the epidemic of prescription painkiller addiction that has killed nearly 200,000 Americans since 1999. A piece from Southern California Public Radio in which one of the authors of the Los Angeles Times story is interviewed can be heard in full here. In 2007, Purdue Pharma and three of its executives pleaded guilty to fraud charges for hiding OxyContin’s high addiction risk, and were fined 635 million dollars (or about two percent of what OxyContin has produced for the company so far). But the issue of the drug’s length of effect – that it is less than the twelve-hour medicine it was supposed to be – was left alone. That remains, and OxyContin is still produced, prescribed, used, and abused as before. The cost of OxyContin addiction, or the heroin addiction that can grow out of it, is colossal, both on a personal, individual basis and on a national basis involving the cost to society of an estimated seven million people who have abused OxyContin since its introduction twenty years ago. The nation will be paying for the consequences of misprision, misappropriation, and misuse of OxyContin for decades to come. It will be expensive. With a revenue stream of 31 billion dollars from OxyContin accruing to its manufacturer, Purdue Pharma, I have a suggestion as to where some of the funding might be sought. Previous Previous post: ARE VACCINATIONS SAFE?